Learn how to repair a vinyl fence simply and easily. Vinyl fencing is relatively easy to install when compared to other fencing options. It’s best to have professionals do the work to ensure the full integrity, strength, and quality of the finished product. Vinyl fences are constructed with prefabricated parts that easily fit together and slide into place. There is no cutting, painting, staining, or sealing. 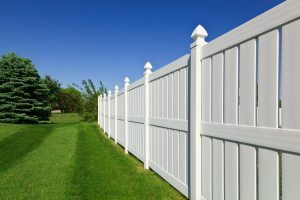 Of all the available materials for residential fencing, vinyl leads the pack when it comes to low maintenance. Vinyl fences are not susceptible to rot or insect infestations. They also don’t need to be painted and they won’t split. For cleaning, the most you’ll have to do is use your garden hose to spray off surface dirt and grime. It’s estimated that well-maintained vinyl fences can last up to 30 years without needing repairs or replacement. If you check with your manufacturer, you’ll probably find that they offer a lifetime warranty with the fence. If you think that choosing vinyl fencing is a mundane choice, then think again. There are a variety of colors, shapes, and textures available. You can even select vinyl to mimic the look of wood or other materials. Vinyl is also available in various heights and topper styles. Going hand-in-hand with its extended lifespan, vinyl fences are also quite durable when compared to other options. You won’t experience any chipped paint, swelling and contracting, rusting and oxidation, or cracking. Vinyl fences are made from synthetic materials that hold up very well against environmental factors. No cracking or splitting means no splinters. There’s also much less of a fire concern. For the environment, you won’t have to use any chemicals or other harsh materials to clean and care for your vinyl fence. This entry was posted on Friday, September 14th, 2018 at 4:41 pm. Both comments and pings are currently closed.